← What’s Up with My Name? Scene: Orchestra pit of the Meralco Theater in Manila many years ago. Opening night of Philippine Repertory’s production of Fiddler on the Roof. It has a small guitar part which I was hired to play. It was a full orchestra but since it’s a play/musical, there were lots of breaks in between the talking scenes. And of course, we can’t entertain ourselves and had to be quiet in between those interminable rests. So, what do we do? 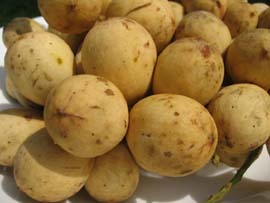 We ate lanzones. Lots of them. 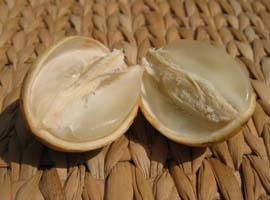 It has smooth, light brown skin and transluscent white flesh inside. Occassionally, you’d get a bonus of a seedless fruit, all flesh and nothing to spit out. Yummy! And since it’s in season, which lasts for only 5-6 weeks, I swear all orchestra members brought bags of this popular snack. Sometimes, we’d look forward to the breaks so we can chow, the music was just something that prevented us from feasting. However, there was one problem. There were no trash cans in the orchestra pit to discard the skins – remnants of a once-succulent fruit. So, we thought why not just chuck them on the floor? Even though it was an incredible mess, we figured we’ll clean up after the show. Finally, the play ends and the main characters took their bows. The rigor of the applause indicated it was a success. All is well that ends well. When all of a sudden, the floor shook. Is it moving? Wait, what’s happening? Is the orchestra pit rising up? Oh yes, the conductor and musicians need to be acknowledged. Why weren’t we told about this? 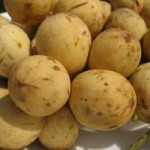 So, there we all were, in full glory for all the world to see, basking in a sea of – lanzones skins! It was a complete mess! Did I mention we looked completely unprofessional? Yes, we were beaming alright, but not because of pride. 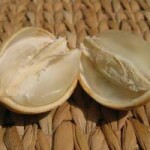 We swallowed that along with several kilos of lanzones. One Response to Concert “Disasters”: Concerto for Guitar … and Lanzones!